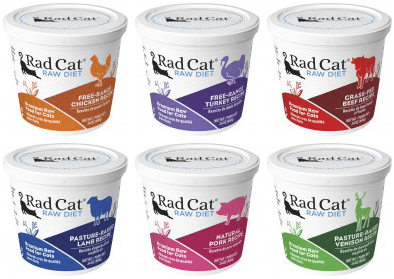 On August 9th, we posted an article about a recall of the Rad Cat Raw Diet Cat Food that just had two types involved. There is now an FDA update that covers all the types of this line of food – issued August 21, 2018. This is a significant expansion of a previous recall announced in July 2018, which was itself an expansion of yet another previous recall announced in March 2018. Now, instead of just a few recipes (chicken, venison, turkey) and a handful of lot codes, the entire product lineup shipped out within a 15-month period — all recipes, all sizes — has been recalled. The products were shipped to distributors in the United States and Canada between May 2017 and August 9, 2018. The packages are all stamped with “Best By” dates ranging from Oct. 19, 2018 to Dec. 3, 2019. As with the previous recalls, Radagast Pet Food says no pet or human illnesses have been reported so far. If you have any questions about recalls for cat or dog food – we suggest that you check out our friends at Petful.com’s Cat Food Recall List for 2018 and their Dog Food Recall List for 2018.